Aerial perspective photos are quite interesting as they offer a broader sight line for the photo, but also permits more content to be captured as well. 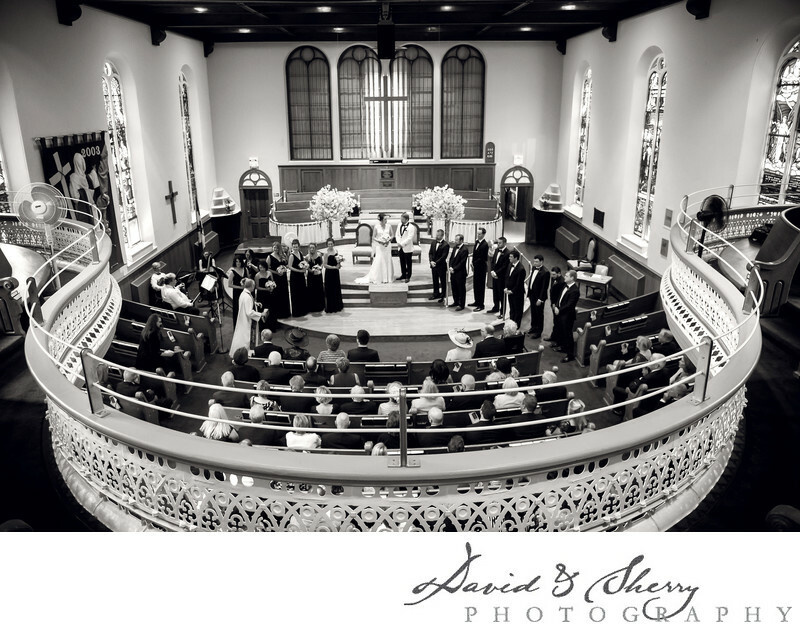 This photo was able to capture all of the bride and groom's loved ones who are sitting in the center of the photo, facing the bride and groom from the pews. The photo also captures the large stain glass windows that provided exceptional lighting of the entire wedding. This photo also captures a Collingwood wedding taking place in the First Presbyterian Church. With the aerial perspective we capture the symmetry of the reception. This perspective provides an almost ring-like shape following from the railing and along the bridesmaids and the groomsmen, with the beautiful bride and groom in white to resemble a diamond on the top of the ring. Overall, this photo fits with the motif that many of our other photos conform to: that is the coupling of the old, timeless elements; being the old church aesthetic, and the black and white filter of the photo, with the modern elements of the use of perspective. We feel that the pairing of these elements is a precise statements of what weddings are: they are age old traditions with a modern flair, each with their own personality that we in the photography profession try to capture. Location: 200 Maple St, Collingwood, ON L9Y 2R2.